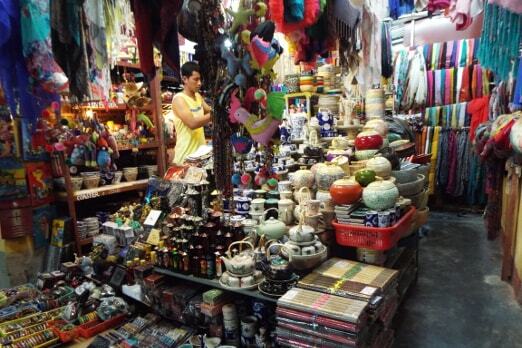 Although it is not as famous as the “Underworld” Market (Cho Am Phu) in Da Lat or Night market in Nha Trang; Sai Gon or Hanoi, Hoi An Night Market (local name: Nguyen Hoang Night Market) still owns a unique and magical feature with tourists in this ancient city. 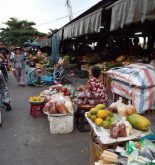 Operating from 5:00 pm to 11:00 late at night, Hoi An Night Market (opposite to Cau pagoda (Chua Cau)) has a length of 300m with nearly 50 booths. 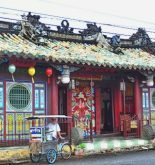 It likes a space of all activities in Hoi An ancient city in miniature. In this place, it’s very easy for tourists to meet the familiar images of the city from the booths of lanterns in various colors, shapes to souvenirs, handicraft products or Hoi An specialities such as High Floor Dish (Cao Lau), My Quang, White Rose Dumplings (Banh Vac), Stir Fried Baby Clams With Rice Cracker (Banh Dap), Black sesame sweet soup (Che Me Den). Street foods at Hoi An night market. However, the most impressive thing is the brilliant booths of lanterns along the whole city. Tourists will feel that it seems to be lost in a mysterious world with lanterns in various sizes and kinds from tube-shaped lanterns, elongated shape lanterns, triangle-shaped lanterns, garlic shape lanterns, hexagon shape lanterns, lotus flower lanterns to paper star lanterns; from paper, silk to bamboo materials… The appearance of all these is really shimmering which makes the whole city more magical. In spite of a market, this place is not only for activities of buying and selling but also an attractive destination for tourists. Since opening up to now, on every night, it’s very easy to meet crowds of tourists wandering in the market, seeing or taking pictures with lanterns to get the moments of the trip. 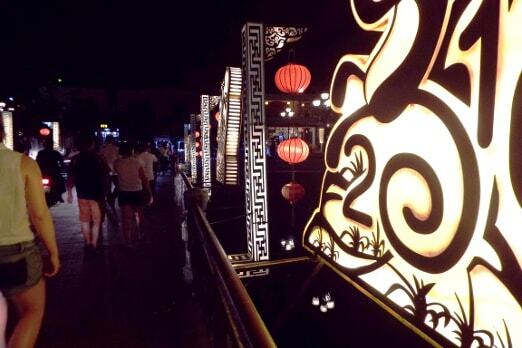 With them, to be taken a walk and live in the night market atmosphere is a special experience. 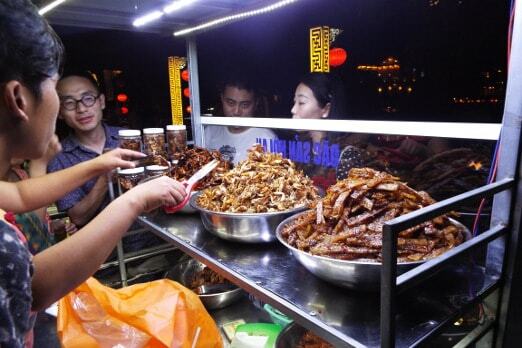 In that place, tourists are not only felt the indigenous cultural values through the sophisticated village products, but also enjoyed a lot of rustic dishes sold simply roadside with the characteristic taste in Quang Land. 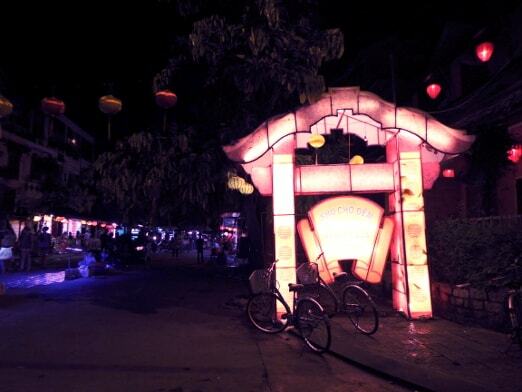 The contribution of all makes the atmosphere of the night market more vibrant and gets a strong color of culture. It’s said that the advent of Hoi An Night Market has created quite an interesting highlight for tourists, especially it connects the space of this ancient city with other surrounding areas such as An Hoi Sculpture garden, Hoai River. 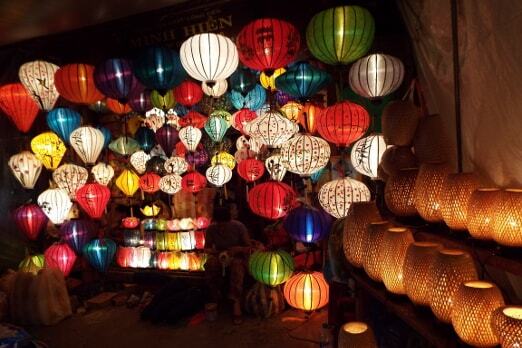 Night Market is also a place to introduce tourists about another fanciful but common, bustling Hoi An to provide a multi-dimensional view of the land and people in Hoi An. Along with folklore activities in the city, on the river, the night market has become an attraction outside the old town. Its contribution offers tourists the distinct feelings about a different, attractive, and vivid space. 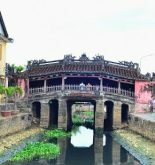 Through such, Hoi An is more attractive in the hearts of tourists when coming to this land.